So today's dress was a little snug on the bust. I don't know if you can tell but I could feel it. I need what the 20s called The Symington Side Lacer. What this bra had was lacing on both sides (kind of like a corset) and you would pull the laces to flatten your bust to get that boyish figure popular in the 20s. I would love to get my hands on a pic of this thing. I can't find one on the internets. And don't forget -- you're not 20s exact because you are ON THE INTERNET!!! LOL. Dummies. 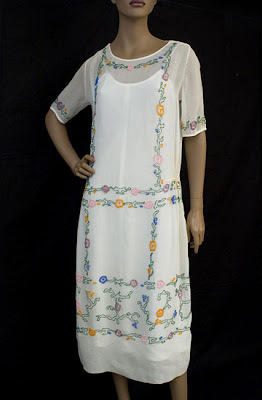 Did you make the dress you're wearing or is it vintage? I LOVE it! I think it's my favorite of your dresses. It's so fresh and springy and very flattering. Andrea, no I didn't make this (I wish I was so talented). I bought it on eBay from a seller who makes 20s reproductions. Her beaded gowns are gorgeous but spendy. Brilliant. Tell me - how advanced would you say you have to be to do beadwork like that? It's exactly what I'd like to be able to do. Being able to embellish textiles like that - wow! 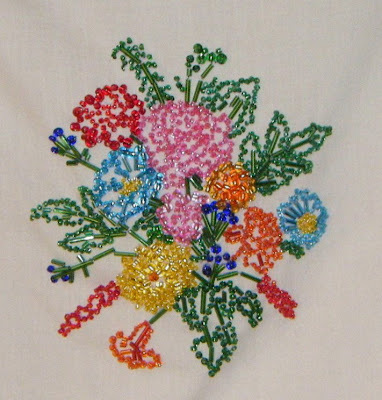 That beading is really lovely-great work! I wish I had time to do stuff like that right now!